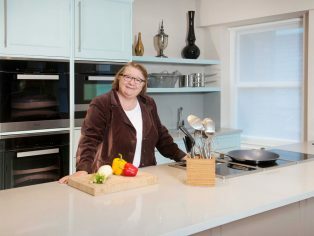 Colourful chef, writer and TV personality Rosemary Shrager has chosen top quality Granite Transformations materials for new kitchen worktops and resurfacing counters, tiled areas and floors at her celebrated Cookery School and nearby Patisserie shop. Although her business premises and Granite Transformations’ UK headquarters are all located in Royal Tunbridge Wells, Rosemary actually came across the brand when presenting regular cooking slots on ‘The Alan Titchmarsh Show’ and discovered the agglomerate materials’ ‘forget about it’ practicality and luxurious good looks. The fact that existing surfaces could be refaced within a single day, without dust, debris or inconveniencing customers, was also a considerable bonus for Rosemary and her busy culinary and retail operations, where disruption of trade would cost money and goodwill. 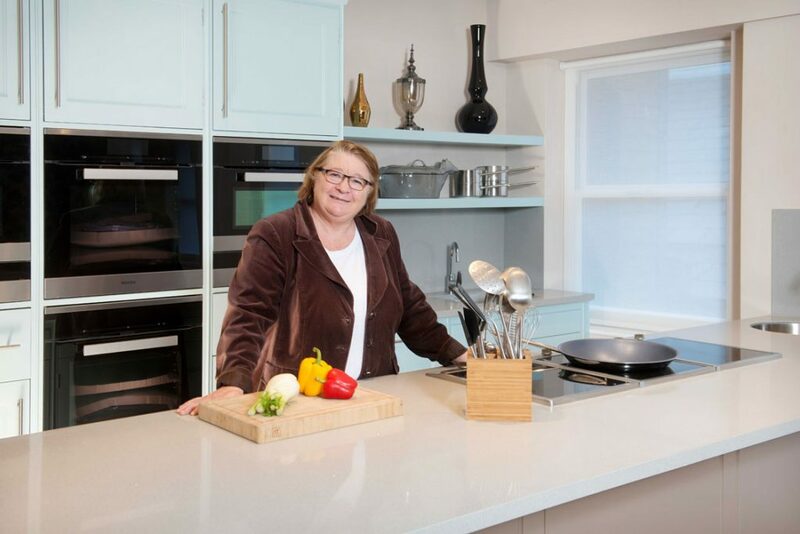 English chef Rosemary Shrager is best known for being an haute cuisine teacher on network TV programme ‘Ladette To Lady’ and a professional judge on ‘Superstar Superchef’. She is a highly accomplished chef, having trained with Pierre Koffmann at the famous Tante Claire restaurant and worked alongside brilliant chef Jean-Christophe Novelli. She was Head Chef at the 19th century Amhuinnsuidhe castle on the Isle of Harris, where she rose to fame hosting a popular television series ‘Castle Cook’, which also lead to the first of many best-selling cookery books. Offering a variety of full-day and weekend culinary courses and hosting exclusive Chef’s Table dining experiences, the Cookery School is located in the gourmet heart of Royal Tunbridge Wells, in the Lower Pantiles. Her French Patisserie opened in January 2014, is located on the Upper Pantiles, serving a wide variety of cakes, light lunches and afternoon tea, as well as fine wines and champagne. A brand new addition to the Cookery School is The Dining Room on the second floor, where Rosemary and Executive Chef John Rogers dazzle guests with exclusive dinner events. It also hosts private and corporate events and provides the setting for filming her TV food programmes. For this high traffic area needing worktops that would withstand all the regular knocks, scrapes and stains of a professional kitchen, Rosemary approached Granite Transformations about installing their extremely hardwearing and luxurious agglomerate materials. The kitchen makeover experts, best known for ‘the top that fits on top’ installation technique, were delighted to prove their worth and their worktops’ technical performance in such a distinguished commercial setting. Granite Transformations’ highly distinctive approach to both domestic and commercial projects is to prefabricate worktops off-site, then drop the finished components into place over existing surfaces, making for neat, hassle-free installations. Rosemary selected elegant, mottled grey quartz Pietra Serena surfaces for the Chef’s Table worktop and splashbacks and Patisserie retail counters, the oversized slabs enabling full widths to be installed with minimal joins and bonded edge pieces giving a pleasing impression of depth. For the cookery school cloakrooms, Rosemary has specified Black Sapphire granite floor tiles, quartz Polar Ice liners for refacing the tiled walls and elegant Subway Pearl rectangular glass mosaic tiles as feature panels. The non-porous and stain, scratch, impact and cigarette burn resistant qualities of these materials will make them ideal for bathroom duties, whilst the ability to install these finishes over existing tiles and flooring should keep washroom downtime to a minimum. The same quick turnaround will be an undoubted bonus when the counters are refaced in the Patisserie shortly. One working consideration is that the large commercial espresso machine has to be disconnected and removed by the suppliers, but the ‘top that fits on top’ technique will allow it to be reinstalled on the same day, losing the minimum of trading time. Rosemary Shrager is delighted that Granite Transformations’ agglomerate and mosaic finishes are robust enough for commercial use, beautiful enough to enhance the existing decor and sufficiently quick to install that normal business can continue without a break.